Tonight I went back through some of the Tweets I have recently favorited and checked out a tweet by George Couros ( @gcouros ) that referred to a post by Andrew Campbell. His post was about "The 5 Most Overhyped Trends in Education." One of the trends he mentions is BYOD. Within this post he provides a link to a more focused post on BYOD, so I went on to read that one as well along with a post by Gary Stager on why he believes BYOD to be the worst idea of the century. All of this reading led me to reconfirm my thoughts on this concept as well. So I was struggling to focus in on a topic for tonight's post. When you need a little motivation where can you go for a post. Well, there are lots of options really. Maybe an article you recently read, or possibly a You Tube video. I have gotten inspiration from experiences at school, home and on occasion from quality TV like Seinfeld, The Walking Dead or my favorite The Big Bang Theory. But, if you are looking for a real PLN experience that is directly focused on the current trends in education, there is nothing like taking inspiration from another educators blog post. I don't want you to misunderstand me. For a while, I was a supporter of this program. I was so eager for technology to become a larger part of the education equation that I was willing to settle for this concept. I am not sure I considered it settling at first, but as I pondered it more and read reflections from members of my PLN, my understanding began to deepen and the drawbacks became clearer. If we can just make a small analogy leap, let's consider how quickly we would reject the idea of student athlete's having to pay for their own athletic uniforms? Too much of a reach? How about if we said, the students that can afford football cleats can bring their own cleats in, and those that don't have cleats can either wear their regular shoes, or wait until the students that brought in their own cleats, were done with a drill, then they could offer to share their cleats with the other students. Still to simplistic of an analogy? How about if we asked the students that had their own Football helmets, high quality Riddell 360 helmets that are superior in concussion protection, but for the students that didn't have their own helmet, well they could use the slightly more used Riddell suspension helmets from 1965. Seem like a good plan now? While I don't think it is necessary that all students use the exact same device, or that students learn how to use just one type of device, the simple truth is there is a difference of what can be done with the various types of tools available. The problem for school districts is that if there are multiple types of devices being used, how do we support them? How do we support the students without their own devices? How do teachers plan for the different devices? How do we support the different types of charging needs? If you are looking for more detail on all the reasons this concept isn't such a great idea, check out the blog posts above. They do an excellent job of explaining all of the inequities involved, and lets face it public education is supposed to be there to be an equalizer.....or am I thinking of Finland? Love the helmet analogy. Great way to make your point. I just can't relate to simple statements on stuff like this. Context is everything. My school has been BYOD for a full 2 years now. None of the issues you've mentioned have turned out, for us, to be issues at all. I'm a firm believer that there are different answers for different schools. 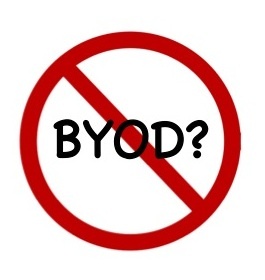 We have a BYOD program that has avoided the issues you mentioned above. I also know many schools that are a 'traditional' 1:1 which fits with their mission and culture. So, while I believe everyone should have a well-reasoned basis for the decision in their school, I don't believe anyone can say that either BYOD or a 1:1 is the only answer for all schools. Steve & Jonathon, I would have to agree with both of to a point. I do think BYOD is a stepping stone for getting schools started in technology integration and it is a way for districts and more importantly for state and federal governments to side step their responsibilities. I also struggle with the idea that all devices need to be the same, but there is also benefits to this practice. I am glad Steve that your school has not faced any of the problems I list above, but I also want you to know that I did not just imagine that list of problems. They are the very problems that BYOD teachers have shared with me either face to face, via blog posts or on Twitter. Again, this is just my philosophy and why I don't think it is the answer for our schools or students. These are my thoughts as to why I think we need to address the technology gap in schools and while BYOD can be a stepping stone (my opinion) I don't see it as the answer until quality tech has become so prevalent that even the homeless have access to it, because yes, we do have homeless students in our schools.